What does it take to become one of the most celebrated and expensive buildings in New York City? High visibility? Prestigious address? Great views? Exclusive neighborhood? Architectural distinction? In the case of 30 Crosby Street in SoHo the answer is none of the above. The correct answer is celebrities. A seven-story former manufacturing building, it was erected in the mid-19th Century and converted to 13 condominium apartments by Landmark Development in 2000. The building has a 24-hour concierge, an aromatherapy system in the lobby, professional-caliber kitchens, sidewalk landscaping, eight 4,100-square-foot lofts, three maisonette duplexes with private gardens, and two penthouses. An article by Sarah Bernard in the April 10, 2000 issue of New York Magazine noted that "in a building where duplex penthouses go for $7 million, tar paper is not an option" for roof decks. "Instead," the article continued, "the deck's sides will soon be covered with titanium - inspired by the Bilbao Guggenheim- and its floor tiled with San Cristobal marble." "It's hard to find that right shade of vanilla with the red veining," Ms. Bernard quoted Landmark Development's Edward Baquero, who is a partner with Stephen Touhey, "who personally traveled to the Dominican Republican in search of the perfect slab." The article maintained that 30 Crosby was then "the current winner in the signifier sweepstakes, adding that "In addition to the Bilbao borrowings, there are wood-burning fireplaces outside on the penthouses' terraces, wide 'rain' showerheads, a 'smart garbage' recycling system that automatically sorts paper and plastic, Bosch appliances, bamboo gardens in back, and a wine cellar/tasting room where residents can store at least 1,000 bottles of their favorite vintages or dine around a farmhouse table in front of yet another fireplace." The building also has a "retro-futuristic lobby" designed by Benjamin Noriega-Ortiz and the article quoted Mr. Baquero as stating "Honestly, I think we're a little nuts. But you exceed people's expectations...and that's how you win the game." The wine cellar is called Enoteca and was designed by Christine Hawley, the wife of Michael Aaron, the CEO of Sherry-Lehman, the famous Upper East Side liquor store. An April 16, 2001 article by Matthew DeBord in The Wine Spectator described the facility as the most impressive of the city's new "cellars," stating that it "evokes central Italy." "The Enoteca achieves its cozy effect through precise detail. The basement has been revamped with false vaulting, iron gates, wood-inlaid flooring, cement...sink, limestone fireplace, reference library and a tasting room that residents can reserve for personal use. Temperature-controlled storage options are tied to individual apartments and included with the purchase price. The maisonettes and most of the lofts get large cabinets, each of which holds 1,000 bottles, while the penthouses and one of the lofts receive spaces that can accommodate 3,500 bottles....A maisonette buyer indicated that the Enoteca was one of the property's chief attractions, second only to its location." A January 8, 2001 article in The New York Observer by Deborah Schoeneman and Deborah Netburn carried a headline that asked "Is Courtney Love the Curse of 30 Crosby Street?" The article maintained that actress Liv Tyler, the daughter of Aerosmith singer Steven Tyler, "wants out before she even gets in," adding that "Even before it opens its raw lofts in Soho, 30 Crosby Street has already had its 15 minutes of fame." The article noted that the actress had signed a contract to buy a $2.5 million apartment in the building in August, 2000, adding that the building was still not completed in January, 2001 "but it has been hyper-publicized to the point where buyers like Ms. Tyler are having second thoughts. Lenny Kravitz and Courtney Love have also signed contracts....Mr. Kravitz bought a duplex penthouse for $8 million, and Ms. Love bought a $2.6 million loft....According to brokers, all the publicity has convinced Ms. Tyler that she, in fact, does not want to live at 30 Crosby Street....Maybe Ms. Tyler is getting out just in time. Although the apartments will not ready until the end of the month, the building has already been parodied by Ben Stiller as the ultimate celebrity address. After he read about the Loft in the tabloids - which reported that Claudia Schiffer, Rosie O'Donnell, Mike Piazza, Cindy Crawford and Denzel Washington had checked out apartments - Mr. Stiller decided to use the model apartment on the third floor in his next film, Zoolander, in which he plays an egocentric male model who is brainwashed into assassinating the president of Malaysia. The apartment in the film, 4B, is the only one of the 13 new apartments that isn't spoken for...."
The building, not surprisingly, got more than 15 minutes of fame. The December 23, 2002 issue of The New York Observer had an article by Blair Golson that Mr. Kravitz had bought a townhouse at 157 East 35th Street on the market for $1,485,000 and had sold it for $1,760,000 before buying his penthouse at 30 Crosby Street. The article reported that the 35th Street townhouse was now on the market for $8.5 million, and added that Mr. Kravitz's penthouse was "last reported on the market in January for $16 million." "In that apartment, Mr. Kravitz earned notoriety for a massive renovation by designer Benjamin Noriega-Ortiz that included suspended staircases, a communal shower in the hallway the second floor and a urinal in the master bathroom." In the April 26, 2004 edition of The New York Observer, Gabriel Sherman wrote an article that noted that the Kravitz apartment "landed an offer at close to the $13.95 million asking price," noting that "In October, 2003, the four-time Grammy Award-winning musician slashed an additional $1 million off the asking price" and "according to sources, the bidder on the five-bedroom, eight-bathroom spread in the Loft, the illustrous building at 30 Crosby Street, is a finance executive who fell for the rock 'n' roll refuge." The article maintained that Kravitz had transformed the penthouse into "a study in rock 'n' roll design," adding that the apartment "features a gourmet stainless-steel and marble kitchen, ceilings reaching 30 feet, a billiard room, a media room, a glass-enclosed terrace with a hot tub and living room that features the apartment's signature detail - an undulating wall that spits fire. A glass staircase leads to the upstairs master bedroom and the three guest bedrooms, while a second glass staircase accesses the roof deck and its built-in grill." "Over the years," the article continued, "the home has reportedly been the downtown crash pad for Mr. Kravitz's celebrity friends, including Denzel Washington and, most notably, Nicole Kidman. During Ms. Kidman's sojourn in the sumptuous spread, a romance was sparked between the rocker and the lissome Aussie. The couple dated before repeatedly calling it quits this winter." "Raucous Courtney Love bought a fourth-floor loft in January 2001 for $2.6-million, and promptly sold the place for $3 million the following year," it stated. 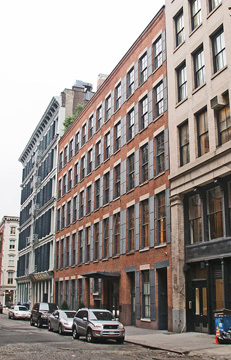 The New York Observer's interest in the building continued unabated and on June 14, 2004 it reported that Nicole Kidman was renting a 4,000-square-foot loft in Soho on Crosby Street while deciding whether to move into her own $8 million loft at 176 Perry Street in the West Village, a building designed by architect Richard Meier. 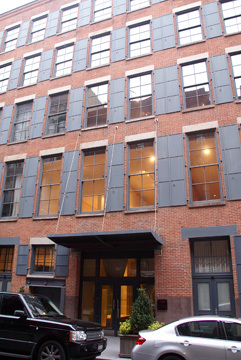 The article coyly maintained that the source declined to give the specific address of the building where the actress was renting a loft "but did confirm that her loft is not in the celebrity-addled 30 Crosby Street development, where the lissome Aussie rented Lenny Kravitz's triplex in 2003." The red-brick building has nice green metal window exterior shutters and a entrance marquee that flares upward toward the street. Its elegant lobby has a chandelier.